BUFFALO, N.Y. -- The Bisons took home a 6-4 victory against the Chiefs Friday night in Buffalo on Conehead Appreciation Day. A strong display of offense was accompanied by a high-octane start from Sean Reid-Foley. The win put the losing streak to a halt at four games. The Herd favored scoring in pairs as it did on three separate occasions throughout the game. In his Bisons' debut, Gio Urshela made his presence known. In the second, he crushed a two-out double off the left-center field wall, giving the Herd a 2-0 lead. 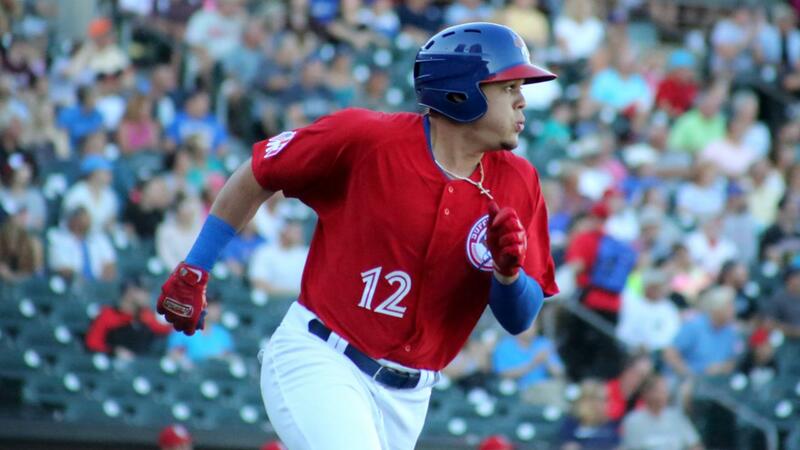 "[He] was fun to watch just because he hadn't played in a while," Bisons' manager Bobby Meacham said about Urshela. "We wanted to get him back out there as quickly as possible… it was good to see him step in there and contribute right away." Danny Jansen and Reese McGuire both scored on the play after each singled earlier in the inning. The Bisons got more two-out production in the third. Jansen went back to work at the dish as he walloped a two-run blast that nearly cleared the protective netting in left field-- his second home run in as many games. After the Chiefs plated three runs in the fifth, the Bisons responded by scoring in their half of the inning. Roemon Fields legged out an infield single before Richard Urena, batting from the right side, stroked a single into left. Fields scored all the way from first on the play on a fielding miscue by the Chiefs. Dwight Smith Jr. added on insurance to the lead when he hit a sacrifice fly, extending the Herd advantage to three runs. The middle of the Herd batting order provided a spark in the lineup as it combined to go 4-8 with three RBI. "We try to figure out a formula to make things work on the offense and hopefully the runs we got tonight are emblematic of what's to come in the future," Meacham said. Reid-Foley pitched against the Chiefs last Sunday and delivered six scoreless innings while giving up two hits and striking out five batters. On Friday night, he worked six innings and struck out eight batters. He allowed a leadoff double to Jose Marmelejos in the second but stranded him on second base after producing three straight outs to exit the inning. Reid-Foley's outing was smooth sailing until the fifth when he allowed three runs in a laborious inning. However, he still preserved the Bisons' lead and pitched his way to a win-- his fifth of the season. The Chiefs loaded the bases and put the potential go-ahead run at first base, but reliever Conor Fisk minimized the damage by striking out Chris Dominguez and Andrew Stevenson as the final two outs of the inning. "I'm proud of them," Meacham said about the pitchers that threw Friday night. "They did a good job throwing the ball over the plate." Justin Shafer made quick work of the Chiefs and closed the door for his ninth save of the year after retiring Syracuse in order in the ninth.